That huge projected surplus provides the underpinning of all the administration's tax-cut and spending plans, Mr. Bush said in his recorded weekly radio address. "A surplus in tax revenue, after all, means that taxpayers have been overcharged," the president said. "And usually when you've been overcharged, you expect to get something back." 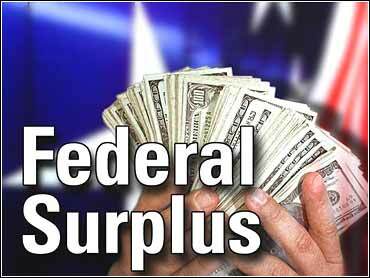 The surplus figure "counts more than any other" in the budget, he said. Democrats cautioned that surpluses projected over so long a period can turn into elusive fool's gold. And they continued to insist that as it stands the Bush tax-cut plan unfairly favors the wealthy over those of more modest means. Click here to see your cut under Bush's plan. Mr. Bush said his budget plan proposes a "reasonable" 4 percent growth rate, which he said is "little more than inflation." He asserted that given the size of the expected surplus, his proposal leaves plenty of room for a large tax cut, while paying for increases in spending on education and for dealing with Social Security and Medicare. "Education gets the biggest increase of any department in the federal government," the president said. But he insisted that "as we give more to our schools we're going to expect more in return." "Social Security and Medicare will get every dollar they need to meet their commitments," Mr. Bush said. "And every dollar of Social Security and Medicare tax revenue will be reserved for Social Security and Medicare." He pledged that his spending plans will not neglect the national debt, now totaling about $5.7 trillion. "After paying the bills, my plan reduces the national debt, and fast," Mr. Bush said. "So fast, in fact, that economists worry that we're going to run out of debt to retire. That would be a good worry to have." The focus of the Bush budget is his proposal for $1.6 billion in tax cuts over the next decade. "Along with funding our priorities and paying down debt, my plan returns about one of every four dollars of the surplus to the American taxpayers, who created the surplus in the first place," Mr. Bush said. Iowa Gov. Tom Vilsack, delivering his party's radio response, said his party hopes that as the tax debate continues, attention is paid to basic fairness. "President Bush's plan insures that the wealthiest Americans receive a healthy portion of benefits of his plan," Vilsack said. "His idea is based on the premise that if they pay more they should receive more. "A fairer way of approaching tax cuts is not to ask who pays more, but who needs the relief more?" "With iddle-income families and seniors on fixed incomes, paying more at the gas pump and more for their electricity and heat, Democrats believe that those families and those seniors are exactly the people who should benefit the most under any tax cut plan," he said.